My last post looking at the complexities of making costumes for ballet this week I will look at designing for it, particularly when the world of fashion meets the world of dance. Designing and making costumes for dance are both unique skills. Costumes for dance must encompass the choreographer’s intention, be ‘readable’ from 60 feet away, be durable and allow movement – all this needs to be contained in a single design. Traditionally in the creation of a ballet the libretto or story line comes first, then the music, then the choreography and finally the design. Despite this hierarchy the creation of a ballet is about a complete unity between the music, choreography and design. This was the philosophy that Serge Diaghilev employed in his ground breaking company The Ballets Russes. Diaghilev based his idea of the Wagnerian concept of Gesamtkunstwerk or total work of art. The worlds of Theatre and Opera are based around similar philosophies which makes it much easier for designers to move from one to other. In the world of fashion, however, the designer is the King and anything is possible - couture fashion has no rules. Recently there has been an increasing trend for fashion designers to design for ballet. This is not a new phenomenon, Coco Chanel designed the costumes for the Ballets Russes production of Le Train Bleu in 1924. Whilst the skill and vison of many current fashion designers cannot be questioned their ability to translate this into world of ballet and movement is often problematic. In 2009 Karl Lagerfeld, in an echo of Coco Chanel, was asked to design a tutu for the solo the Dying Swan for the English National Ballet Company’s celebration of the Ballets Russes. No expense was spared and the resulting tutu was exquisite with amazing detail, beading and feather work. Once onstage however the detail was instantly lost looking clumsy and heavy (more a chicken then a swan). Lagerfeld designed a high feathered collar that was so restrictive it was only worn for one performance. The costume had been created solely on the designer’s vision not fully accounting for movement and the distance at which it would be seen. In September 2012 New York City Ballet commissioned Valentino to design a series of costumes for their Fall Gala. He designed 25 costume for 4 ballets. 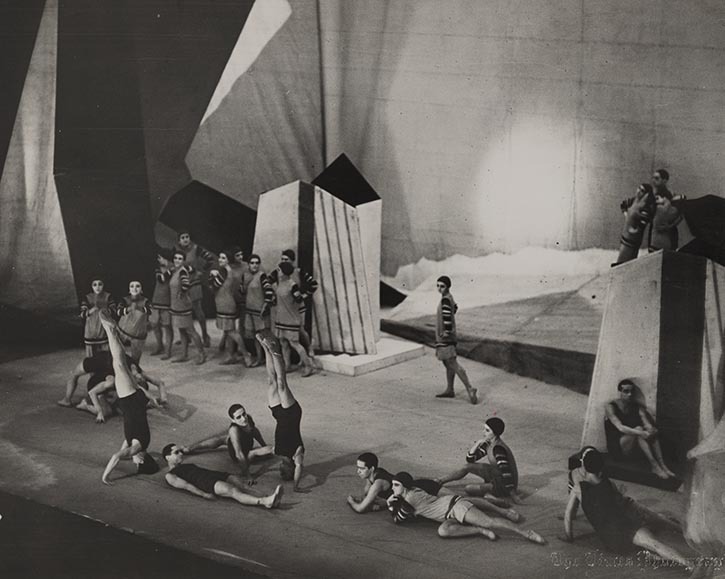 For these ballets choreographer Peter Martins decided to choreograph based on Valentino’s designs rather than have the costumes reflect his choreographic concept. Valentino’s designs where all heavily based on couture and he had to be continually reminded that the dancer would need to be able to move in these costumes. The following video taken of Valentino in the costume shop shows the creative process with the makers and dancers. For Valentino it was all about the costumes and the choreography and dancers merely became a way to present and display his work. So can fashion and ballet design mix? Ballet has often inspired couture and even filtered down to high street fashion – think tutu skirts and ballerina flats. Fashion designers have often used dancers as models and in the 1910s Leon Bakst revolutionary designs for the Ballets Russes influenced Paris fashion on a huge scale bringing colour and exoticism to everyday dress. On the other hand costumes designers constantly use aspects of fashion both current and historical as an inspiration for ballet design. In the world of fashion, however, the design is everything; in the world of ballet the design must fit within specific boundaries and work with both the choreography and music. They are just simply two very different (but beautiful) worlds!